Composition is one of the most important components in photography and the rule of thirds can be a great start in helping you get that great shot. It is actually one of the very first things budding photographers learn when they start to take classes in photography. It could also be one of the first few pieces of advice they get from professionals. The reason why it is on top of most, if not all photographers composition rules is that it serves as a great foundation for capturing a well-balanced shot. It also gives photographers the chance to create interesting photos when they start to pay more attention to how the rule of thirds creates lines in their shot. The rule of thirds is also used by artists to produce a good composition in their paintings. In fact, in 1797, John Thomas Smith wrote about it in his book Remarks on Rural Scenery. He was expanding on work in 1783 by Sir Joshua Reynolds about the balance of dark and light in a painting. Artists continue to use the rule of thirds for composition in paintings. 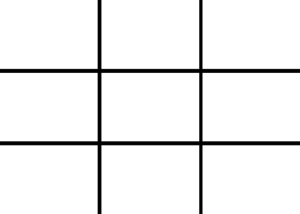 When you start thinking about the rule of thirds, you need to remember that it is simply breaking up an image into nine (9) equal parts just like the image below. You do this by putting lines vertically and horizontally along the image you are looking at. There are cameras that allow you to put actual lines over your image before shooting but most professionals simply commit these lines to memory. As you look at the lines, you need to identify two very important points – the intersections created by the lines and the lines themselves. This will help guide you in framing your shot to put emphasis on points of interest and positioning other important elements in your photo. The theory behind putting important points in your photo along the intersecting points of the lines is that the image becomes more balance and it guides the viewers naturally. This is because rather than looking straight in the center of an image, people have the tendency to look at one of the intersecting points first. Take a look at the sample photo below. The bird was placed in one of the intersecting lines to make it more natural. If it was in the middle, it wouldn’t have the same effect. Another photography tip on the rule of thirds which is widely used by landscape photographer is positioning the horizon along the lines. Doing so helps photographers make a much more compelling piece and it helps separate their work from a casual hobbyist. For one, using the rule of thirds makes photographers stop and compose rather than firing away hoping to get a good photo. This photography technique gives you the choice of putting the horizon closer to the top line or the bottom one. This depends on what you want to highlight in your photo. The rule of thumb is to put the horizon on the top line if the sky is not that great. Doing the opposite and putting the horizon at the bottom line is usually done when the foreground is a bit boring. Take a look at the sample photo below. The boats were lined up on the lower line while the buildings were positioned on the upper line. The rule of thirds usually comes naturally for some professional photographers. They also use it in addition to a few more composition techniques such as leading lines and framing which we can talk about in another article. One other importance of understanding the rule of thirds is so you can break it. Yes, you need to learn it to know how to break the rule. It can result in some striking shots if you experiment with it. Lightroom uses the grid when cropping an image, and it can be applied in Photoshop as well. While cropping an image in the post-production, it is very easy to apply the rule of thirds to your composition. This is also a very good way to experiment with your composition. Apply it, or crop to center your composition. Which is more pleasing to you? This post-processing software allows you to quickly crop your photos in any ratio. As you do this, you get to easily position points of interest in your photos. 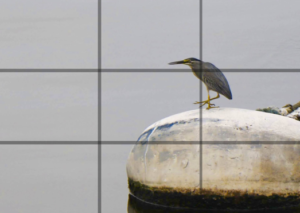 You get more control over how you use the rule of thirds to your advantage. If the highlight of your portrait photo is the dominant right eye, you can easily move your image to have that point over an intersection in the lines. This ability to post-process your images should not encourage you to go on shooting without any regard for framing or thinking about the rule of thirds. It is a great tool to use but not an excuse to get sloppy with work. Imagine how beautiful photos were created in the past without any post-editing software and using analog cameras. You need to keep in mind that technology cannot replace great shots straight out of your camera. It can only do so much and it is still up to you make sure that you are able to manage your composition. You can do this with the help of rule of thirds and other composition techniques. As discussed earlier, the rule of thirds can be broken. In fact, many professional photographers will break this rule to create amazing images. However, it is still one of the most important things to consider when setting up your shot. In the end, it is your image and the composition you set up is a big part of what makes it your image. It should be what you, as the artist, wants it to be.